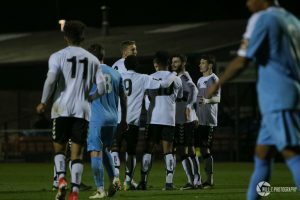 In one of the most important games this season, Weston and East Thurrock played out a 1-1 draw at the Woodspring Stadium. 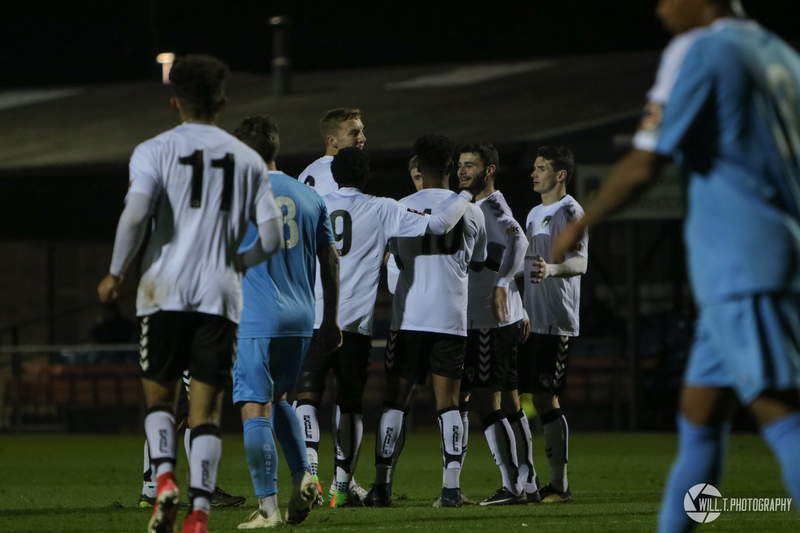 On a chilly evening at the Woodspring, Weston looked to gain the early momentum as Jennison Myrie-Williams sliced an effort from inside the box out for a throw-in. George Nurse’s shot after Gethyn Hill had knocked a long Luke Purnell kick down, was narrowly wide of the target. Weston almost scored with one of their corner routines, but Tom Llewellyn’s effort was deflected wide for a corner. From the set piece, Weston took the lead. Using a different corner routine to the first, Alex Byrne rolled the ball to Nurse on the edge of the area. 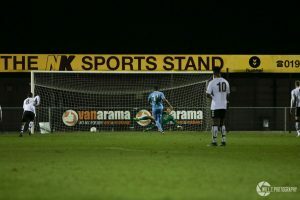 The left-back struck the ball first-time, but connection wasn’t the greatest and his effort was heading wide, until the ball bounced off the foot of Ryan Scott and into the back of the net for 1 – 0. Weston almost doubled their advantage when Nurse broke into the box and squared the ball across to Hill, and if it weren’t for the keeper’s heroics, Hill had an easy tap-in, however the shot-stopper got down well to push wide for a corner. From the set piece, the ball bobbled around and was eventually cleared off the line by a visiting head. From the corner, Pope received the ball on the edge of the area however his pass to feet was sloppy and cut out. 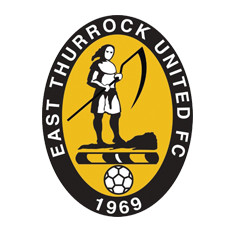 East Thurrock hared forward with a 2-on-0 situation however the two attackers, thanks to the quick attention of Louis McGrory to put pressure on the opponents, fluffed their lines and wasted the chance by overhitting a pass. After the interval, Weston struggled to get a foot on the ball and keep possession, but a chance fell their way when Purnell’s long kick forward fed Hill in behind, but from an angle, the striker’s chip was pushed away for a corner. East Thurrock managed to equalise just past the hour mark through a slightly contentious refereeing decision. A Weston set piece strategy failed to come off and the away side could break, feeding one of their forwards. Haring in behind, the striker and Nurse were involved in a tangle of legs, with the referee pointing to the spot. Up stepped experienced striker Shaun Batt, who sent Purnell the wrong way and levelled things up. Knowing that a point wouldn’t be good enough this evening, Nurse had a pot-shot at goal from 25 yards after collecting a cleared set piece, and Marlon Jackson was a toe away from getting something on a teasing Byrne delivery. Into second half added time, Hill appeared to go down in a tussle with an East Thurrock defender inside the area, however the referee waved away the appeals as the game drew to a close. 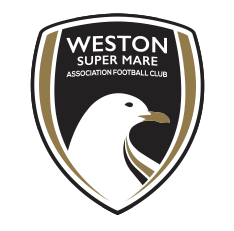 Weston XI: Purnell, McGrory (Diallo 63), Nurse, Lee, Pope (C), Bower, Llewellyn (Cane 63), Byrne, Jackson (Swallow 83), Myrie-Williams, Hill. Unused subs: Lucas, Kingston. MOTM: Jake Lee – In a midfield battle, the defensive midfielder put himself about the park and once again, commanded the highest from his team-mates.